Details have been released of alternative travel options available when London Bridge rebuilding work begins on 22nd December. The work sees some rush hour trains cut on the Greenwich line. 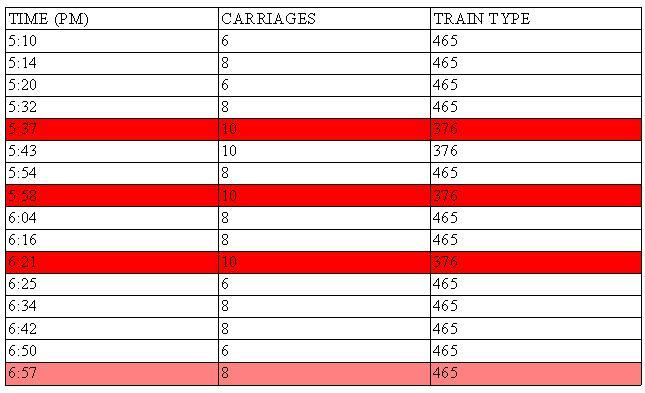 I’ve also managed to obtain details of current train lengths from a source who works for southeastern. Red means cut completely. Pink is a train that still runs but will not stop at London Bridge, and heads to Lewisham from Waterloo East before joining the line at Charlton. Class 376 trains are newer higher capacity unit. Class 465 ‘Networkers’ are the ’90s trains with greater seating but lower overall capacity. Firstly, I want to state that the rebuilding work at London Bridge is absolutely essential. There are huge bottlenecks on the approaches which hold up trains, and passenger capacity is strained. The future station looks fantastic. This blog isn’t against change as some are, and being so negates many legitimate arguments. Three years of hardship is the price to pay. My criticism comes from the lack of planning and mitigation to cope with changes, which I’ll expand on later. For people heading to Charing Cross in the morning, how many will get off at Greenwich, take the DLR to Lewisham, then taking another train given just how busy trains are at Lewisham? It saw an increase in passengers last year of 10.89%. It may be better to stay on to Cannon Street then taking the District or Circle line tube to Embankment assuming those tubes aren’t at capacity, as I’d expect a fair few tube passengers to get off at Cannon Street. Jubilee seems to be always rammed so not sure that’s a good choice. Coming back at peak times I don’t see much point in taking the train to Lewisham from Charing Cross, then DLR to Greenwich, to wait there with three less trains coming along and no chance of a seat as rammed by time of arrival. Best off on tube to Cannon Street. That does mean more people onboard by the time train arrives at London Bridge. As can be seen above, the cuts are focused from 5:30pm to 6:30 pm which is the busiest hour, and maintaining capacity at this time seems extremely difficult. It would have been possible if 12 car trains were able to run, but all signs point to this not happening with the short platform at Woolwich Dockyard preventing it. Action should have been taken here to allow 12 car trains on the line, as this issue has been known for years. Deptford is losing 4 trains from 5-7pm (and 6 from 4-7pm) yet has seen high growth levels recently – passenger numbers were up 7.3% last year. Trains to Lewisham then a DLR will help some here. People moving into the many developments featured in my last post, around Maze Hill (passengers up 1.9% on the year) and Westcombe Park (up 2.3%) will benefit less from the DLR option. One option not offered is DLR from Woolwich to Bank. This is no surprise given the revenue loss that would ensue. Plus, I’m not sure the DLR could take it. 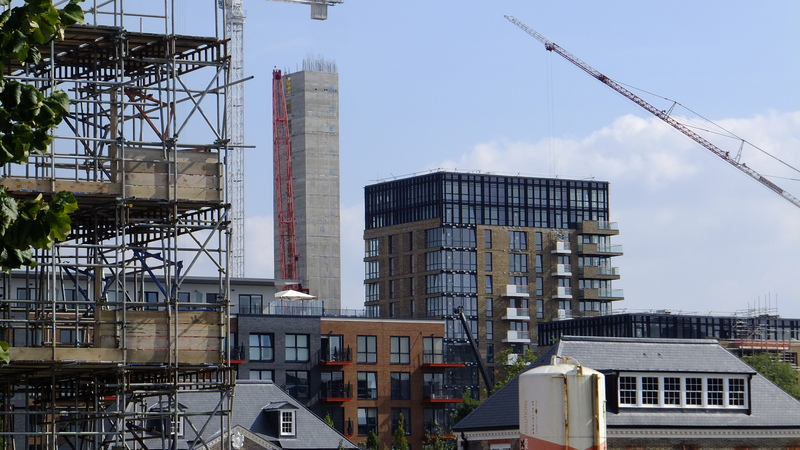 However, in Woolwich a further spike in passengers can be expected soon just as capacity is reduced, as 684 homes are now under construction from Berkeley Homes at the Arsenal site, with some ready for occupation by early 2015. The Connaught estate demolition has also just begun. People move into 332 new homes from 2016. There’s also 74 homes at the old co-op that will be ready shortly. There’s many other sites in planning but those are ones that will be occupied soon. COST. DLR – £1800 annual season ticket. Train – £1,284. FREQUENCY. DLR – every 8 minutes. Train – around every 8 minutes. Given the cost savings of the train yet similar services, it’s likely a fair few people moving to the area will use the train adding greater pressure. The train ticket is more restrictive on travel options, but if you work in the City that’s not an issue. Though Thames Clippers may be able to take up some slack from newcomers to the Arsenal. Prospective Conservatve candidate for Woolwich & Greenwich, Matt Hartley, has just begun a petition here calling for improvements at southeastern. Whilst laudable and good to see, the requests such as asking for retention of direct trains to Charing Cross seem misplaced. It will be impossible the next three years, and allowing it from 2018 would mean disrupting the greatly enhanced Thameslink service planned. As a major 20 year project costing billions, Thameslink is Network Rail’s big poster child and they will not jeopardise its running for one line. The train length issue is mentioned, but focus here should be on the Department for Transport who allocate rolling stock and order new trains. There’s 32 carriages potentially available on open-order with Bombardier. This is a follow on order for 108 carriages being built for Southern trains. The 32 additional carriages option is not currently taken up and would help the situation in SE London. Focus from local politicians could be directed there, along with securing existing stock from other places. One prime example is Thameslink receiving new stock from December. This will eventually allow some ‘class 365‘ trains to be free. These worked on southeastern previously and are sister trains to existing stock. I’d recommend local politicians look into the immediate issue of service cuts from January leaving central London from 5:30pm to 6:30pm. It now seems too late for many solutions that would have helped to be in place, but the focus should be on getting certain things done as soon as possible with that particular squeeze. There was years to look into these and it hasn’t happened. Rather ridiculously Networker trains will also now go away to have a disabled toilet installed. This should have been done the past 6 years, along with altered seating for more space. Trains were going north to be repainted the past 4 years – wouldn’t it have made sense to combine that with internal work? Now is the worst time to start doing it, but that’s what’s happening. Hopefully after some initial teething trouble some people will find alternative means of travel and things settle down. For many however, this is impossible for 3 years. If problems such as overcrowding do become far worse those in charge cannot say it wasn’t predicted. The closure of London Bridge platforms has been known for years as have issues on the Greenwich line, as well as large scale residential developments along the route. Many potential solutions have not been taken up for more and longer trains. Any focus on improvements should be directed on alleviating this as soon as possible. Thanks. It does seem rather stupid that Southeastern aren’t increasing the number of coaches on any of the remaining services to compensate for the loss of 30 coaches on the services being axed! The remaining services can all be increased to 8 or 10 coaches without any platform problems. How could that have been allowed to happen when those existing services are already full as it is (I know, because I used them on a daily basis)?! Southeastern can’t blame lack of rolling stock, because there will be 30 coaches that will now presumably be stuck in a depot. The cynic in me thinks that Southeastern are using the Thameslink Programme to axe capacity knowing full well that its customers will be forced to use the remaining overcrowded trains whilst getting the same revenue with fewer trains and lower rolling stock costs.